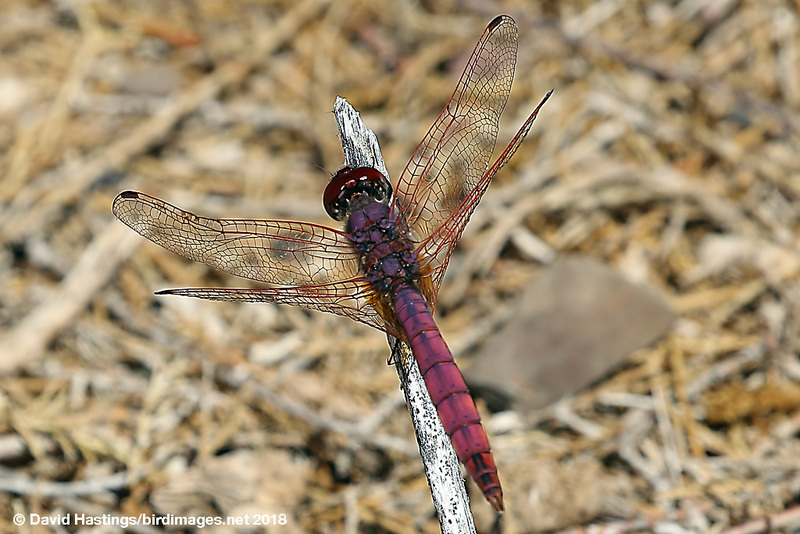 Violet Dropwing (Trithemis annulata). Male. Taken at Barranco de la Antigua, Fuerteventura, on March 13th 2018. Approx 3.75x lifesize. Male. Taken at Barranco de la Antigua, Fuerteventura, on March 13th 2018. 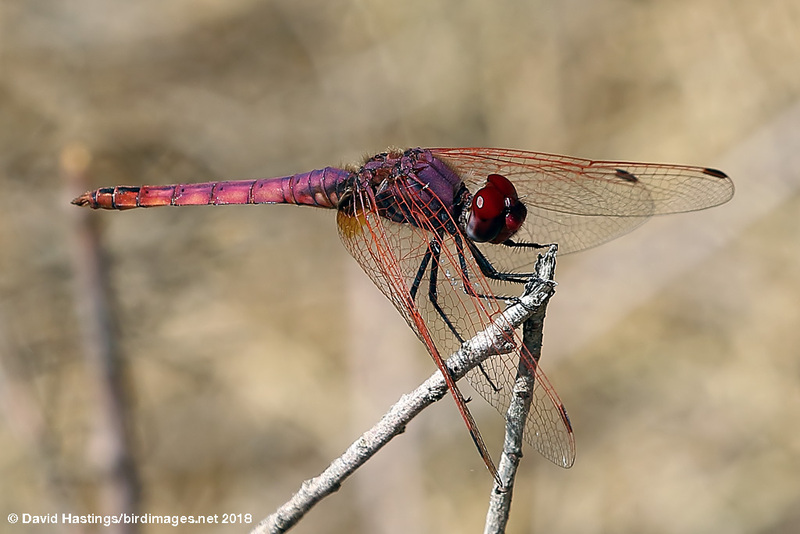 Violet Dropwing (Trithemis annulata). Male side view. Taken at Barranco de la Antigua, Fuerteventura, on March 13th 2018. Approx 4.5x lifesize. Male side view. Taken at Barranco de la Antigua, Fuerteventura, on March 13th 2018. 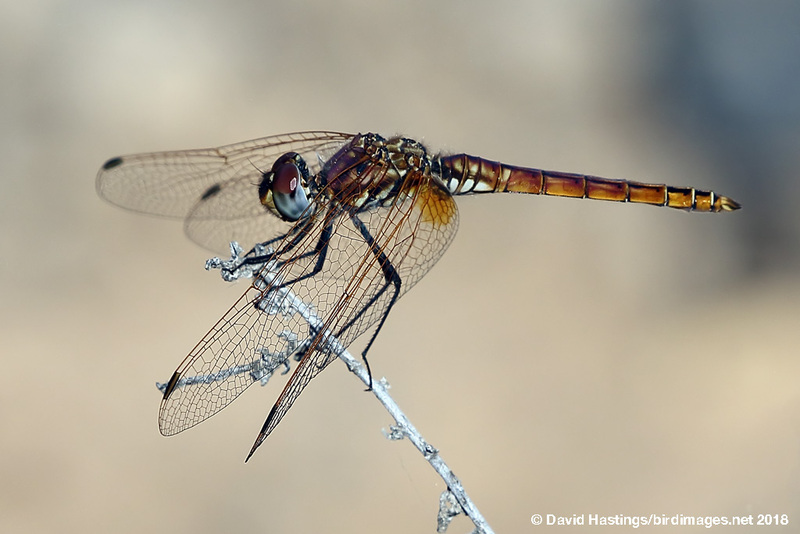 Violet Dropwing (Trithemis annulata). Female side view. Taken at Barranco de la Antigua, Fuerteventura, on March 13th 2018. Approx 4.5x lifesize. Female side view. Taken at Barranco de la Antigua, Fuerteventura, on March 13th 2018. The vividly violet male of this African species is unmistakable. The female is yellow-brown. Both sexes have a large yellow patch at the hindwing base, and red wing veins. This is one of the most abundant dragonflies of tropical Africa. It is now found around the Mediterranean, and on the Canary Islands. It favours shallow gravel pits, open lakes and lagoons. It is probably continuously brooded in the Sahara, but in north Africa and southern Europe it is active from May to October. The larvae develop rapidly. Males perch prominently on waterside stakes.